I've only discovered the Moomins as an adult; very recently in fact, when I read the entire series in ebook format at the end of last year. Tove Jansson was Finnish but wrote in Swedish, and these have all been translated, more than once. I've been utterly enchanted with them, and think I would have loved them as a child. Just my thing; weird, unpredictable, funny, melancholy, with nature, songs and friendships high in the mix. The Moomintrolls are a family of trolls who look vaguely hippo-ish: Moominmama, Moominpapa & little Moomintroll, whose family is the centre of a larger circle of characters in this odd little world. The Moomins & the Great Flood is the first book in the series; I found it a bit different from all that follow, in some key ways. First, it's very short in comparison, only 52 pages. Next, and more vitally, it's much more fantastic and dream-like than the following stories. It's a little fairy tale on its own; the Moomins' home is flooded in a great spring flood, with Moominpapa away with the Hattifatteners, a group of silent nomadic creatures. 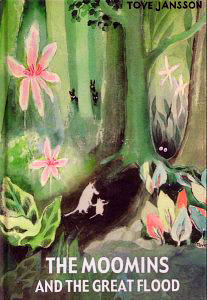 Moominmama and Moomintroll flee into a forest to escape and come across flower fairies, shadowy creatures, and dangerous serpents; they reach a safe house where an old man has a garden full of sweets but realize the false nature of this temporary security and keep moving. They sail across the sea in an armchair and finally find Moominpapa up a tree where he's escaped the flood, and together they settle into their new house in Moominvalley where they will live for much of the rest of the series. You can tell from this that it's a plot-filled short novel, with dream like logic and magical coincidences. It's slightly creepy in the best way, and is quite unsettling. It was also the last of the 9 Moomin books to be translated into English and is apparently considered to be more of a 'prequel' than the start of the series. It was weird and wonderful in a very Finnish way. As to the next book, it starts the series proper. Many of the recurring characters are introduced in Comet in Moominland. 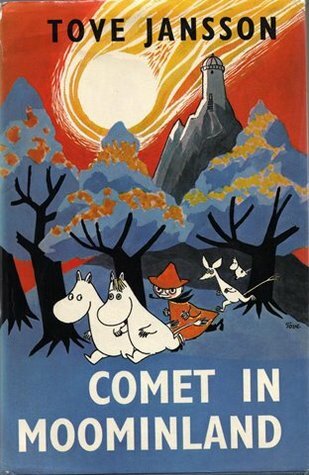 And still in this one, the world is unpredictable and unsafe -- young Moomin and his friend Sniff travel at great length to an observatory in the mountains to get the truth of an ominous prediction about the arrival of a comet that is going to land right in Moominvalley and destroy everything. It's a Frodo & Sam kind of journey with perils and encounters with new creatures along the way. In the end, the comet does not destroy Moominvalley (though it does in the comic book version of this tale) and the family is restored, along with their friends, to safety. The tone of the book is dark, with the looming destruction of their comfortable world in the forefront. The characters' roles seem reversed, with the children going on a journey to find out what is happening and the parents at home seemingly not taking things as seriously. I've read that both of these books were written in wartime and reflect the uncertainties and terror of the war years, along with Jansson's own resultant depression. I only found this out after reading the whole series, but it really makes sense, as these two are definitely the most unsettling of the series (although I'd make an argument that the eighth book in the series was more terrifying to me as an example of an existential crisis). Reading them as an adult is perhaps more of an intellectual experience, with the implications of political and social thought in its context standing out for the reader. As a child, I think I'd have been more likely to simply engage with the characters and the fantastical events for themselves, and fully enter this imaginary world. But I really, really liked this whole set of books -- some particular titles more than others but as a whole they are quite wonderful. I only wish I'd discovered them sooner. I love they way they're drawn. Exactly -- there is so much for an adult reader to love. We have just discovered Moomins too. I mean, we knew about them but then one days one of my daughters took a comic out of the library and then we had to take ALL THE COMICS out of the library. I haven't read any of the novels yet but the comics are amazing - and very existentialist. My husband and I have found ourselves reading things aloud and comparing notes as we read through them. And of course they are very cute so my daughters love them. The existential themes are constant, and I think one of the things most appealing to me. I find her characters so fascinating.